Gouache is an often overlooked paint medium comprised of watercolour mixed with chalk to give it an entirely opaque effect. Cheaper than high quality oil paint, and easier to use for the fact that it can be thinned with water, it is an ideal substitute for both oil and acrylic, especially for bold colourful works. Often used in graphic work and for poster art, gouache is an unsung hero of paint. Although gouache is completely opaque it does reflect light, meaning that whether flat or in impasto, it can produce light effects. The fact that it is opaque also means that it holds the light very well with bright colours. 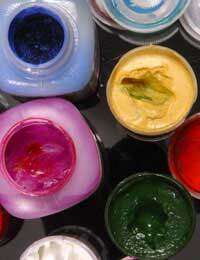 Gouache is easy to handle and very economical as thinned gouache paint spreads over a wide area of paper. Good examples of Gouache painting can be seen in some of Van Gogh’s (1853-1890) works as well as in the work of Swedish painter Anders Zorn (1860-1920). The use of paint like gouache is thought to go back as far as decorative Islamic art of the 12th Century. It has been used in its current form as ‘Gouache’ since the 18th Century. Gouache’s quick coverage and easy handling have made it a popular paint among designers and outdoor Fine Artists alike. However, the relatively fast drying time of gouache and the fact that it cannot produce translucent effects means that it has some disadvantages when compared to oil paint. For this reason it has normally been considered as an ideal paint for sketching out ideas, rather than one to build a career or body of work around. This should not put off the developing artist as so many painters turned to gouache when it suited them, not least amongst these being Matisse (1869-1954), who executed a number of ‘blue nudes’ in gouache. Matisse clearly observed the capacity of gouache for evoking strong bold planes of colour. Painting with gouache requires relatively little in the way of specialist equipment, although a smooth quality paper may be desirable to maximise flow and minimise absorption. Good brushes are a great help, with one being kept especially for each colour group. As with oil and acrylic, a tube each of the primary colours, and one larger tube of white should suffice when you first buy gouache. When starting with gouache try a series of portraits painted quickly from a sitter. Ask the sitter to pose for just 6-7 minutes in each position, and do the best to capture their expression (purely facial, or full bodily). Also be sure to get them to wear bright colours, and try to furnish the scene with bright throws and plants too. Try and paint in their entire surroundings in this time too. Doing this will help you to appreciate gouache for its strengths as a medium that can be applied fast and which conveys bright colour well.